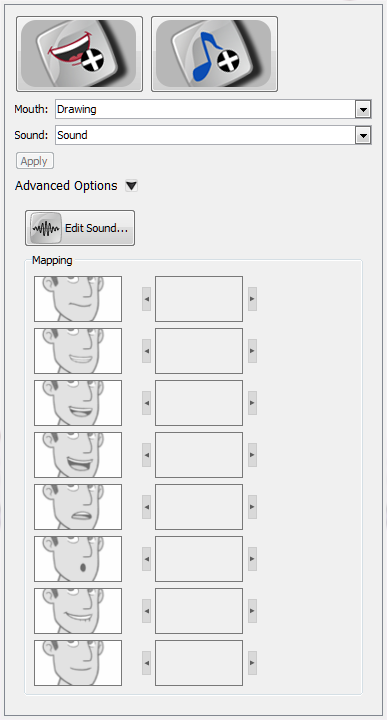 Lip-sync View: The Lip-sync view is where you can create and map mouth charts, as well as import mouth templates for your characters. To open the Lip-sync view:Select a sound layer from the Timeline view or a cell in the Exposure Sheet view.Do one of the following:From the Sound toolbar (Top toolbar on Mac OS X), click the Lip-sync button.In the Properties panel, click the Lip-sync button. Sound Element Editor: The Sound Element Editor is where you edit sounds that were created outside of Studio and imported into your scene. Import Sound: Lets you locate and select sound files to import. The Sound toolbar lets you access the Lip-sync view, Sound Element Editor view, and import sound. The Sound toolbar is located at the top of the screen in Studio. Once you have imported a sound file, you can easily access the Sound element editor and Lip-sync views from layer properties.